Think about that for a second, Multi Hosted Cloud Storage Interface. That’s quite a mouthful isn’t it? This idea hit me as I was registering for yet another cloud storage solution, what if someone created something novel and different from all of these services? The idea would be to create a (possibly encrypted) set of data and span it over a number of cloud storage solutions to create one unified and mountable storage location. (Think of it as adding a drive letter to My Computer in Windows). Let’s take a closer look at this after the jump. Cloud storage is all the rage right now. There are a number of services online that offer freely accessible cloud storage space (with options to increase space by paying). This list is by no means exhaustive. The above storage limits are current at the time of writing this blog and are likely to increase over time. There are a bunch of services not covered on the above but may be just as usable. Cloud storage is becoming a hot market and only looks to get hotter. This is the key, really. I imagine a case where, without security options on, one could really see a single cloud storage (mounted) drive sitting at 50 or more gigabytes. This could be added too simply by connecting and adding new services to the list as you go. There would certainly have to be a component for recoverability if a service drops off, and for making files still accessible when the service is lost. But, this idea would essentially send “chunks” of file data or these services in small amounts. These small pieces of data would be reassembled on the client end (running on any client like Dropbox) and used to synchronize and store the data. It would be important that the pieces of data would be accessible manually (if you were to, say lose a connection to the service but could download the data manually) and that the data could be “cloaked” as documents, zip files or PDF files. Ideally, the amount of redundancy could be controlled (to the point where the local drive could be used to store some of it too). The file pieces themselves would contain the specified amount of redundancy in case of a loss of service, data read errors, or in the case of accidental file loss. This is always a balancing act when adding more redundancy adds to the storage overhead, and thus reduces the amount of total accessible storage ont eh various services. For those super worried about the security of their files – this application would include the ability to encrypt the files chunks from the client end. This would require a key set from the client-side and maintained on each of the client computers. From the cloud storage end, none of the files would have any usable data in them. 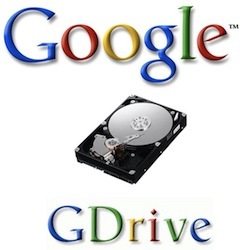 For a while there was some hype and rumor swirling around Google’s GDrive possibilities. This was eventually killed off internally by Google; but I have to imagine the possibilities if Google resurrected this idea and added the ability to connect to other cloud drive services in a RAID or distributed manner? Sure, this may be Google admitting that “files” exist, but the application itself would be a major rethinking of file storage (which, let’s be fair, does still exist and will for some time). There is little or no chance a Microsoft or Apple would do something like this. Barring the above, I could see a small cloud storage startup using this kind of idea as a way to sell and promote their service. A small (and very agile) startup company could really make an impact with this kind of forward thinking on storage. How do you see a storage solution like this working? Do you think there are any companies out there that could make this kind of thing a reality?